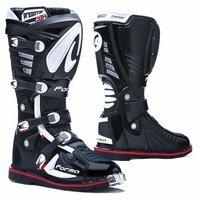 Introducing the Forma Predator 2.0 Enduro offroad boots featuring brand new technology never seen before on offroad boots. FCS is effectively an ankle brace, with the support frame is built into the main structure of the boots. Let’s have a closer look. When the boot flexes, there is virtually no lateral movement, this offers the rider amazing ankle support. That’s why Forma continues to prove themselves in World MXGP and DAKAR racing. Our pro test riders tell us the Predator 2.0 Enduro boots are lighter, extremely comfortable, they can feel the controls, they shift better, and they can ride for longer!